Next generation mobile app development demands additional tools and services. It is only possible with the use of advanced and specified frameworks. The current post is focusing on top 7 Android app development frameworks that can help Android developer explicitly in-app success. Mobile apps are available for everything you imagine. Out of competing native mobile OS platforms, Android has an edge in terms of numbers of apps on Google Play Store as well as a number of devices operating using Android OS. To cite reasons are many but the fact is that Android app ecosystem is thriving, ranking, and fast growing. It is naturally tempting many to have an app running on Android devices and leveraging offerings of the latest Android OS to achieve app goals covering a huge audience available on the Android ecosystem. Creating a native Android application using default Android Studio and native programming technologies like Java and Kotlin are if not easy, but time-consuming and restricted up to native Android devices. In due course, some other technologies and frameworks available to create native-like Android applications. 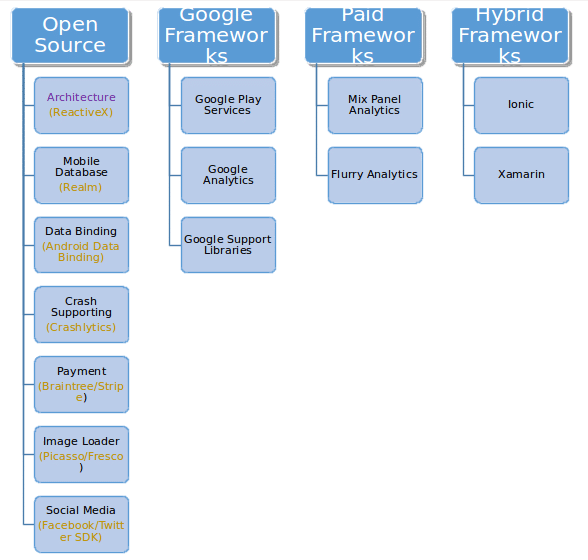 For the sake of better comprehension, we can classify the existing and mostly used Android app development frameworks in following categories. We cannot cover all given or available frameworks in the current post, so I have decided to discuss only seven vital Android app development frameworks here. As its name suggests, it specially designed to render native UIs for Android applications without relying on a WebView. Therefore, it provides more native access to the various hardware and OS components to yield native-like experiences. It is a classic framework now distributed by Apache Cordova to create and deploy mobile apps across the platforms including Android. Plugins by Cordova empower framework to connect apps to native APIs. Its real-time analytics is capable of giving insights into Android app performance and opportunities to dig out marketing or monetization opportunities. It supports material design and follows design standards prescribed by Google for Android app development. Therefore, it is favorite among the Android app developers coding for multiple platform compatibility. It is the best fit for data-driven Android application development demanding intensive back-end interactions. However, officially it depicts as a type-safe REST client for Android & Java. Therefore, it contributes to data exchanging between the back-end server and Android app. 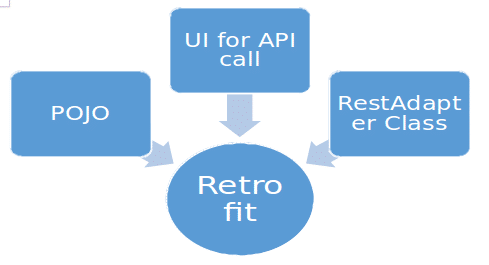 Retrofit has powerful HTTP client library for Android, which grants Android apps incredible performance and easy to incorporate. It also allows straightforward downloading of XML or JSON data via the web API. It allows parsing of downloaded data into a Plain Old Java Object (POJO). It is specifically designed as database framework for open source community. It is a powerful Android framework and can replace the heavy SQLite & Core Data by being faster and simpler framework for Android applications. It makes search speed faster than any existing frameworks. You can get two-way data sync with real-time collaboration and offline experiences. You can do everything with just a few lines of code. Thus, you can obtain faster and agile Android application when going with Realm framework. It also allows full Angular JS integration as well as the integration of other JS frameworks as per the preferences of the Android app developers to get expected results. We have explored the details of various Android app development frameworks and found that for different purposes different frameworks are applicable and provide enhanced app development experiences, access to features, functions, and services through built-in tools and libraries in frameworks. The author is an SEO & Research Analyst at SysBunny, a standard mobile app development company based in the USA. She has a very detailed knowledge of the mobile app industry. She has a knack to understand client needs and always keep exploring new things in the emerging IT field. Good job sir, I am glad to read your shared post, such an informative article. Thanks for sharing an article about future generation mobile apps and Android framework.